Here's a colorful, mostly-green recipe to celebrate with; a lightly dressed raw kale-slaw that is even better the next day!! I think cutting the leaves into thin pieces is key. Then dressing it ahead of time softens it up a bit. 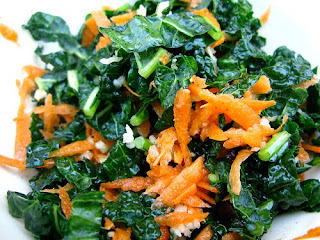 Unlike other greens, kale doesn't totally wilt when dressed ahead, so this salad is good for several days. 3 cups kale greens (dinosaur/black kale or curly kale), shredded or chopped fine - measure after chopping, packed firmly in cup. In a large salad bowl, add the lemon juice, Vegennaise, ginger, salt and pepper, whisking to combine. Add kale, apple and carrot and toss well to combine. Taste and adjust seasonings to suit yourself, if needed. Oooh! Yum! I haven't tried raw kale in a while -- your recipe sounds delicious. Any salad that uses raw kale is a winner in my book! And this combination sounds particularly tasty. I bet the ginger adds a terrific zing. And I agree, you really need to dress kale a bit early to allow it to "mellow"! I might actually like this. I typically avoid raw kale cause I think its yucky. But I bet it'd be good after sitting in the dressing for awhile. This looks good! I will try it soon! I just had raw kale this week and it was really good! I always assumed I wouldn't like it. Now I have to try this. Thanks for sharing the recipe. This salad gets rave reviews every time I bring it to a potluck. It's so colorful and tasty!